Now that there are so many different forms of orange to be had, I like to make this salad with a mixture of varieties. Those used here are just a suggestion; pick whichever are looking most handsome when you go shopping. I've discovered it is much easier to make a caramel the chef's way, without water: I just toss the sugar into a dry, heavy-based pan over a moderately high heat which dramatically reduces the time it takes to caramelise. My one word of caution regards the type of sugar. For once, I do not advise you use an unrefined type. It will disguise the degree of caramelisation. Stick with standard white caster sugar. You can make a lighter salad with an uncaramelised syrup; dissolve 300g sugar in 200ml hot water and simmer for about 10 minutes with the zest, until thickened but not coloured. Pare the zest from two of the oranges and cut into very fine shreds. Drop into a pan of boiling water, simmer for 2 minutes then drain well. Set aside. Peel the clementines, removing as much of the pith as possible. Slice all the peel and pith from all the oranges with a sharp knife, then slice both oranges and clementines thinly, and lay the slices in a shallow dish, along with any of the juice you can retrieve from slicing. Measure out 200ml hot water in a jug and place near the hob. Heat a large, heavy-based pan over a medium heat. Add the sugar (it should be in a thin layer, so it's important to use a large pan) and heat for a few minutes, watching carefully, until the sugar begins to melt. Do not stir it. Just tilt the pan to get the sugar to melt evenly. Once liquid, let it bubble gently, then crazily until it begins to brown (though you may find the sugar is already brown by the time it's all melted), swirling the pan occasionally. Once the sugar is hazelnut-brown, pour in the measured hot water at arm's length. Be careful: the caramel will spit and hiss, but then calm down. Now you can stir the syrup. Drop in the blanched orange zest and simmer for about 10 minutes, until it's translucent. Pour the hot syrup and zest over the sliced oranges and leave to cool. Serve lightly chilled or at room temperature. 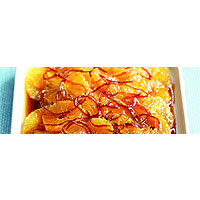 The caramelisation takes all the natural, acidic aggression out of the oranges, so a seriously tangy wine is unnecessary.